Sydney Storer Boot was born in Nottingham in 18852, the second of five children, eldest son, of John (b. c1858, Nottingham) and Emma (b. c1862, Nottingham née Storer). In 1901 the family, including all five children was living at 212 Blue Bell Hill Road, Nottingham with John working as a hosiery warehouseman while Sydney was apprenticed in the same trade3. In 1909, Sydney married Florence Edith Brown, the daughter of Frederick & Mary Brown of 1 Glebe Street, Beeston. Their first child, Doris Mary Boot was born in the following year4. By 1911, Sydney, Florence and their daughter were living at 1 Mona Street, Beeston with Sydney working as a hosiery warehouseman5. Their second child, Frederick John Boot was born in 19126. As a slightly older married man with young children, it is perhaps understandable that Sydney was not amongst those who enlisted so enthusiastically in the early months of the war. By 1916, however, the number of men volunteering for service was diminishing and was not meeting the relentless demand from the Western Front and the Government was looking for ways to fill the gap. The Derby Scheme, which introduced canvassing for volunteers had still not persuaded the required numbers and the Military Service Act was now enacted which meant that all single men aged between 18 and 41 (with some exceptions) would be automatically conscripted. In May, this was extended to married men and in 1918 the age limit was extended to 51. Now, Sydney had no choice and he enlisted in September 19167. It appears that, initially, Sydney joined the East Riding Yeomanry, probably the 'Second Line' 2/1st Battalion, then stationed near Beverley, as reserves for its 1/1st Battalion then stationed in Egypt and Palestine8. But the urgent need was for infantry on the Western Front and Sydney was soon transferred to 7th Battalion The King's Own Yorkshire Light Infantry which had been in France since July 1915 as part of 61st Infantry Brigade, 20th Division. After training, Sydney probably joined this battalion early in 1917 and would have probably been part of the German retreat to the Hindenburg Line, would have experienced the horrors of the various phases of the Third Battle of Ypres (widely known as 'Passchendaele') and, in December, experienced the early successes and later disappointment in the the Battle of Cambrai when new ideas and new technologies were deployed for the first time. At some point, possibly during 1917 or maybe in early 1918, Sydney became attached to 2/5th Battalion9 which had been in France since January 1917. During March 1918, the battalion was near Bapaume in support of the line. A major attack by the enemy had been expected for some time as enemy positions had been strangely quite. Then, on 21st March, the German Army launched its Spring Offensive from the Hindenburg Line with the objective of ending the war before American troops and resources could tilt the balance towards the Allies. The objective was to smash through the Allied lines, push the British forces into the sea and to cut off their supply lines by seizing the ports. On this first day the enemy had attacked heavily after an intense bombardment and those facing their attack had suffered heavy losses and had been forced to fall back when the line was pieced. 2/5th involvement was centred particularly on the 24th/25th March during what was know as the First Battle of Bapaume. Amongst a scene of total confusion, it fought strongly alongside weary colleagues and, often, without food or supplies. It would be early April before the on-going German attack lost momentum and the line was stabilised10. Although the timing and circumstance of Private Booth's death, recorded as 27th March, is unclear, it may be consistent with his being wounded during the battle of 24th/25th and his possible evacuation to a Casualty Clearing Centre where he died and was buried nearby. The German advance and the continuous action during the subsequent days and weeks meant that many graves were lost under the battlefield. If this hypothesis is correct, it seems that Private Boot's grave was one of those lost11. Therefore, having no known grave, Private Boot is remembered on the Arras Memorial in the Faubourg-d’Amiens Cemetery which is in the Boulevard du General de Gaulle in the western part of the town of Arras. The cemetery is near the Citadel, approximately 2 kilometres west of the railway station. The Faubourg-d’Amiens Cemetery was begun in March 1916. It continued to be in use by field ambulances and fighting units until November 1918. After the Armistice the cemetery was enlarged when graves were brought in from the surrounding battlefields and from two smaller cemeteries in the vicinity. The cemetery contains 2,651 burials from the First World War. The Arras Memorial commemorates almost 35,000 soldiers from the United Kingdom, South Africa and New Zealand who died in the Arras sector between the spring of 1916 and 7th August 1918 and have no known grave. 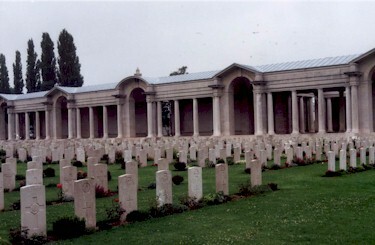 The most conspicuous events of this period were the Arras offensive of April-May 1917, and the German attack in the spring of 1918.The cemetery also contains the Flying Services Memorial which commemorates nearly 1,000 airmen of the Royal Naval Air Service, the Royal Flying Corps, and the Royal Air Force, either by attachment from other arms of the forces of the Commonwealth or by original enlistment, who were killed on the whole Western Front and who have no known grave12. Private Boot was posthumously awarded the British War Medal and the Victory Medal13. His Army financial effects of £17 9 5d, which included his War Gratuity of £8 10s, were paid to his widow and children in October 191914. As was the case for the many, many women who were widowed by this terrible war, Florence had to somehow face the future and bring up her two young children as best she could. Happily, in Florence's case she could rely on the solid support of family - both her own and her husband's for real help and support. Her new life was to centre on the Sherwood area of Nottingham, initially 99 Mansfield Road in Daybrook, to where she moved soon after the war. It seems likely that both her husband's family and certainly her father's family were very forthcoming. Sarah Brown, who had died in the month before Sydney was killed, was married to Samuel Theodore Bunning, one-time Stationmaster at Beeston who had gone on to make a fortune at Beeston Brewery (read more here), and it was Samuel who was able to remember Florence's two children financially. In his will, following his death in 1928, he left £2000 to each of them, when they reached the age of 21.15. Several members of Sydney's family also settled in the Sherwood area of Nottingham and there seems little doubt that they formed a strong family network. By 1939, Florence and her daughter, Doris Mary Boot, had moved to an attractive property at 16 Trevose Gardens, Sherwood and, it seems had become active in the local church community. The nearby St Martin's Church had opened in 1927 as a replacement for an earlier temporary building that had begun to serve the developing community from a site at the rear of The Cedars. The then Vicar or the Parish, the Reverend Edward Lysons, became dedicated, as part of his ministry, to providing a more permanent church building. The present fine church building. opened in 1937, that now stands on Trevose Gardens, now Grade II listed, was the result of his hard work and that of his parishioners and supporters16. In 1951, The Revd Canon Edward Lysons married Doris Mary Boot. Florence Ethel Boot died on 7 November 1963, aged 75. Edward Lysons died on 12 November 1968, aged 77. His widow, Doris Mary, died on 14 June 1966, aged 78. Frederick John Boots, Sydney & Florence*s son, who had married Lavinia Burrows in 1933 and worked as a Post Office engineer, died on 20 May 1972, aged 6017. 3Nottingham, 1901 Census, Piece 3176 Folio 142. 4They were married at Beeston Parish Church on 20 June 1909. Their daughter Doris Mary was born on 6 June 1910. 6Frederick John Boot was born on 11 January 1912, probably at Beeston, Notts. His birth was registered in Basford Registration District (of which Beeston was part) in Q1/1912 (Ref 7b 523). 7As his Army Service Record has not survived, his attestation date has been calculated based on the amount of his War Gratuity. His attachment to the East Riding Yeomanry (as No, 62281) and 7th Yorkshire Light Infanry is from his entry in 'Soldiers Died in the Great War'. 8This outline of the East Riding Yeomanry is based on that on the Long Long Trail website (www.longlongtrail.co.uk/army/regiments-and-corps/the-british-yeomanry-regiments-of-1914-1918/east-riding-of-yorkshire-yeomanry. 9This attachment to 2nd/5th Battalion is recorded on his Commonwealth War Graves Commission memorial page. 10This brief description of the Battle of Bapaume is derived from that in its Wiki entry at en.wikipedia.org/wiki/Operation_Michael#First_Battle_of_Bapaume. 11This remains a speculative theory and an attempt to bridge the difference between the date of the Battle of Bapaume and the recorded date of his death. 13Details from Sydney's Medal Card and the Medal Rolls - available on ancestry.com. 14Details from "Army Register of Soldiers' Effects, 1901-1929" - available on ancestry.com. 15Bunning is likely have helped Sydney and Florence in other ways too. It is probably significant that their home in Beeston, at 1 Mona Street, was immediately behind the Queens Hotel, a public house owned by Bunning. 16More details of Edward Lysons' contribution to the building of St Martin's Church is on its website at www.stmartinsherwood.org.uk/history/default.htm .